The tall White Spruces that add beauty to Village Point Urban Townhomes in Chaska, MN require annual treatment for spider mites. Without early spring treatment the spider mites eventually will kill all the evergreens: the arborvitaes, junipers, and pine trees. Last week the arborist who treats the association’s evergreens told us what we didn’t want to hear. Because of rising temperature, the Greater Twin Cities Area of Minnesota will no longer be suitable habitation for the evergreens. In five years they will be dead or on their way to becoming a memory of a cooler climate in Minnesota. It’s one thing to believe that climate change is real. It’s another to learn of a real consequence that drives it home. You have to work really hard at denial! Driving home to Minnesota from Key West, Florida, Kay and I stop for lunch near Mobile, Alabama. 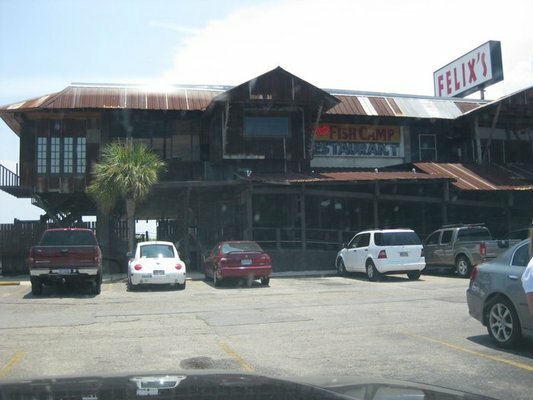 Trip Advisor ranks Felix’s Fish Camp the #8 most highly recommended of 581 restaurants in Mobile, right on the waterfront. An old fish shack; our kinda place! In his late-2os, Brian is very tall. He kneels down beside the table to get acquainted. He introduces us to Felix’s, talks about the menu, asks about our tastes, and zeroes in on the dishes we might like most. 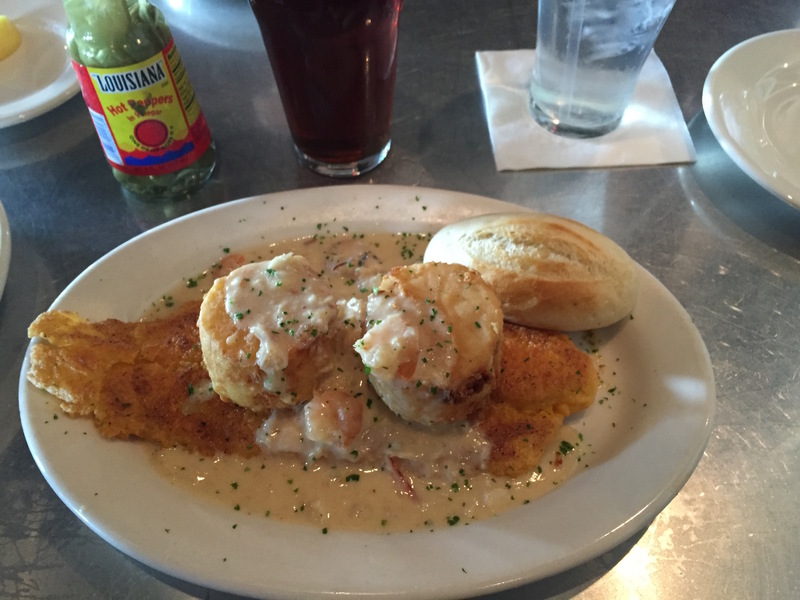 Brian delivers the fish, topped with fried oyster, shrimp with cheese grits, and side dishes of almond green beans, cheese grits, and turnip greens to die for. At just the right moment, as skilled waiters do, Brian returns to ask whether we’d like desert, maybe some lemon pie or Key Lime Pie. The lemon is more unique to Felix’s but he thinks perhaps we might prefer the Key Lime. After the Key Lime pie, we thank Brian for his extraordinary hospitality and service, promise to write a review on TripAdvisor, pay the bill, and say goodbye. His wife grimaces. We just smile. Maybe he’s forgotten that he’s from Duluth, or maybe he’s being playful one last time…or maybe he’s confusing Christian and Republican. We’ll never know. Life is funny like that. All schools in Minnesota will be closed Monday out of concern for children’s safety. Governor Dayton wants no child left behind freezing at a bus stop. The prediction is 50 degrees below zero with wind chill. Meanwhile, seven-month old Barclay is practicing for his first trip outside in booties. He’s a champ, despite the slur in the narration. He’s attending his first obedience class Monday night in New Germany, MN. Unless they call school off. It’s the eve of Martin King Day. This morning’s Star Tribune tells the story “Murderous ‘monster’ acquires an arsenal” in Carver County, Minnesota. Three cheers to you, Jim Olson, Carver County Sheriff. Thanks to the Star Tribune and other newspapers for keeping us informed. Today in worship we will look again at the call of Samuel and the call of Jesus’ first disciples who asked Jesus an odd question. “Where are you staying?” “Come and see,” he said. I wonder: Are there guns where Jesus lives? Minnesotans will vote in November whether to amend the MN State Constitution to define marriage as between one man and one woman. This beautiful video of “old love” features couples in long relationships here in Minnesota. The music and the pictures speak for themselves. Some of the faces are from a congregation I once served. Enjoy. A sermon inspired by the personal story of a king who was losing it and his son, Absalom, leading to the larger question of how we define abundance in our time. If you can get by the first minute and have the time – it’s dreadfully long 🙂 it might be of interest. Please let me know your responses to the last part of the sermon re-defining the idea of abundance.